It’s not often that advertisers get to break world records. But when Mistress Creative, a boutique agency based in Los Angeles, was tasked with helping Mattel’s Hot Wheels reach a new demographic, the team members minds went immediately to stunts. 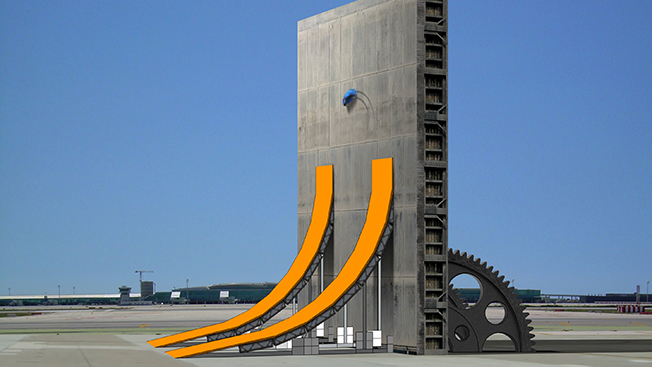 At the 100th Indianapolis 500 in 2011 and the X Games in 2012, Mistress and Mattel unveiled life-size, world-record-breaking versions of Hot Wheels products—the 100-foot V-Drop at the first event and, wilder still, the Double Loop Dare at the second. In tandem with these events, Mistress developed a mythical storyline about a secret Hot Wheels Test Facility, which it told through 11 videos that drew millions of views on YouTube and across social media channels. What were some of the goals of the Hot Wheels campaign? Hot Wheels was in an interesting position a few years ago, where the average American boy between ages 3 and 8 owned 45 Hot Wheels cars. And men became collectors of Hot Wheels in their 30s, when they bought their kids Hot Wheels. So, there was this huge gap in the market for Hot Wheels … which was this 16- to 25-year-old male audience. The simple lens for our campaign was turning Hot Wheels from a toy brand into an entertainment brand. The more we could make Hot Wheels relevant to a whole new audience, the more new product and licensed opportunities would open up. How did you land on the idea of doing live stunts? We were presented with an opportunity very early on in the conversations with Mattel, which was the 100th anniversary of the Indianapolis 500. We decided that was going to be the moment when the whole world looked at Hot Wheels differently. We replicated a Hot Wheels product—called the [V-Drop]—and launched a car off a 100-foot door, along a ramp, and broke the long-distance jump world record. Alongside that activation, we had in place the social media strategy, [and] we launched a whole bunch of branded content, which was then revealed on a 30-minute TV show that ran straight after the [Indy 500 race]. All the sudden, there was a new voice … that was able to talk to this new audience. The next year … we were presented with an opportunity to do something at the X Games. And that was when we again did another record-breaking stunt, which was the Double Loop. We merged [that event] with a story that was told through branded content through 11 episodes. Why did you decided to take a narrative approach to the campaign? What about Hot Wheels as a product lent itself to storytelling? The entire narrative came from the idea of this mythical place called the Hot Wheels Test Facility … [where they] tested cars and tracks on a life-size scale. We sat down with the guys from Mattel, and we had a series of awesome, creative sessions, where we literally rewrote the history of the Hot Wheels brand. It was an internal rallying cry for the guys at Hot Wheels. [They] could look at their brand totally differently. When you brought the live stunt ideas to Hot Wheels, was there any hesitation on its part?